The Centre for Creative Arts (UKZN) has announced the lineup and programme for the Time of the Writer festival, as well as new partnerships for its 19th edition. Ten writers from South Africa and Africa will meet for a week of stimulating literary dialogue and exchange of ideas. Audiences can engage with award-winning writers, from a variety of political and social contexts, on the creative and technical processes and perspectives which shape their writing. Evening readings and discussions will take place at 7pm at eKhaya Multi Arts Centre (KwaMashu), Ohlange High School (Inanda), Umkhumbane Hall (Cato Manor), Umlazi Cinema and Clermont Hall. This years panel discussions couples authors whose writings share semiotic marrow and are loosely titled after books and papers that echo their literary sentiment. Ashwin Desai and Mishka Hoosen will have a conversation on the importance of retrospective meditations on self, historical figures and the family. In this Dany Laferrière inspired panel discussion Panashe Chigamudzi and Eusebius McKaiser share their experiences as writers who write without curiosity’s gaze. Crossing the borders from short stories to novellas to poetry to essays, writer Niq Mhlongo gives insight into his unique take on the world across genres and mediums. Writing for listeners is an art that requires its own stage, a stage of which Christa Biyela and Mandla Ndlovu are accomplished masters. These two audio drama maestros open their lyrical vaults and with it the history and depth of the Zulu audio drama. How pliable is truth? Can one measure the elasticity of the human imagination and if pushed, would one ever erase the self from one’s own story? In this panel, musician turned author Nakhane Touré and Nikhil Singh discuss the roles fantasy, biography and imagination play in the erection of the worlds they create. 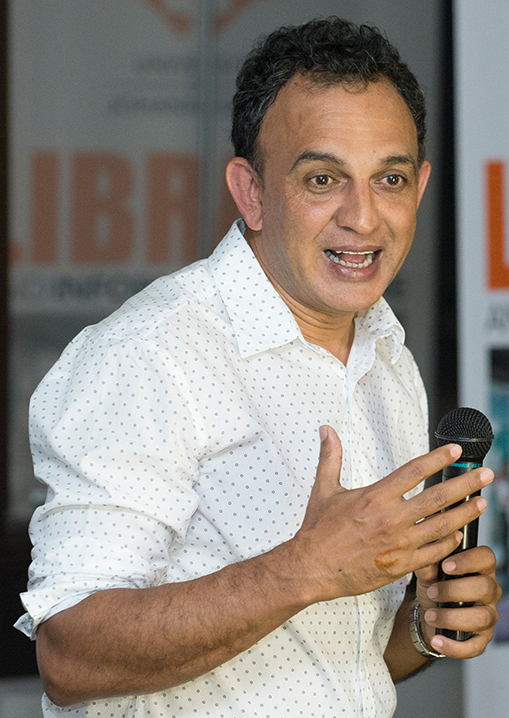 As part of the festival’s focus on decolonizing South African literature the festival will gather leading voices from every facet of literature in the areas of writing, editing, publishing, translation, marketing, bookselling and promotion (including events), to interrogate the central question of how to go about decolonising literature in South Africa, from writing to readership. Conversations that Matter is a daytime programme of roundtable discussions, led by experts across the various fields of literature, that provides a space for people to share and contribute towards this vital topic ofdecolonisation within literature. The following topics will be under discussion during the day from 11am. Writers Niq Mhlongo, Panashe Chigamudzi, TO Molefe, Percy Zvomuya, Nakanjani Sibiya and poet Mputlane wa Bofelo meet to expose the landmines that await writers who render text that challenges literary traditions and their inherent exclusion of certain voices. To probe the accessibility of literary institutions and the tribulations of those tasked with creating that access, this conversation culls from the experiences of both publishers and distributors. Has the South African literary landscape shifted to accommodate previously poorly documented and valued contributions? Which attitudes delay decolonising access? To open the discussion are Prof. Sihawu Ngubane, Thabiso Mahlape, Kholeka Mabeta, Duduzile Mabaso, Mandla Matyumza, Siphiwo Mahala. To explore questions on readership often posed to booksellers, librarians and festival organisers are Cedric Sissing (Adams Books), Benjamin Trisk (Exclusive Books), Fortescue Helepi (African Flavour Books), Sinenhlanhla Buthelezi (Goethe Library), Tebogo Mzizi (eThekwini Municipality Libraries), Mignon Hardie (FunDza Literacy Trust), Frankie Murrey (Open Book Festival), Dr. Maria Van Driel (Jozi Book Fair) and Jennifer Platt (Sunday Times). This conversation draws on the challenges of pricing, public expectations and historical misconceptions on reading cultures in South Africa. An interrogation of the notion of linguistic hierarchies in print media, literature and academic institutions requires contributions from academics and cultural producers whose careers are dedicated to the preservation and promotion of marginalized languages. This conversation will be initiated by Eric Ngcobo, Dr. Mpho Monareng, Dr. Gugu Mazibuko, Dr. Pamella Maseko, Prof. Nobuhle Hlongwa and Wangui Wa Goro. As a result of recent shifts in the quality of contributions produced outside the academy, the topic of Intersectionality has relocated academics and social commentators alike. The youth are proving to be the aorta of the argument and keeping pulse with contemporary readings on Intersectionality demands the voices of those who bravely tackle this pertinent and inflammatory subject. To open the discussion are Eusebuis McKaiser, Milisuthando Bongela, Nakhane Toure, Lindokuhle Nkosi, Mputlane Wa Bofelo, Mbali Matandela and Zethu Matebeni. The 19th edition of the festival is presented in partnership with various organisations including the eThekwini Municipality Libraries department whose involvement supports the community engagement programme of the festival by hosting Conversations that Matter in public libraries. All events are FREE to library or student cardholders. For members of the public without either card, a nominal fee of R20 will be requested at the box office from one hour before the event. The eThekwini Municipal Libraries along with The Centre for Creative Arts will be on hand at each venue in order to aid those without library cards to sign up for one on the spot, all that it requires is a valid ID document and proof of residence. For more details about this years' Time of the Writer, visit the www.cca.ukzn.ac.za or call (031) 260 2506. Organised by the Centre for Creative Arts (University KwaZulu-Natal), the 19th Time of the Writer is supported by eThekwini Municipality, the National Department of Arts and Culture Alliance Française de Durban. The Centre for Creative Arts is housed in the College of Humanities at the University of KwaZulu-Natal and is a special project of the Deputy Vice-Chancellor, Professor Cheryl Potgieter.